“How can one download videos from YouTube to an Android phone?”“What is the best Android app for downloading YouTube videos?” Can I download YouTube videos to my SD card?” “How to save YouTube videos in my phone gallery?” We often see many questions like these in Android forums or Quora. If you are a Windows user, you may find it easy to save YouTube videos on PC as there are numerous options, like Gihosoft TubeGet or other best YouTube video downloader in the market. However, as more and more people use Android phones and tablets, you must feel an urge to install a free YouTube downloader for Android. Don’t worry, in this article, I will share 8 best YouTube video downloader Android apps for you to download YouTube videos to internal storage or SD card for free in 2019. Here is the list of top 8 YouTube video downloader apps for Android. TubeMate is a very popular Android app for downloading YouTube video, one of the most searched apps in many famous App stores. It allows users to download YouTube videos directly on mobile devices at fast speed and high quality. Apart from grabbing videos from YouTube, TubeMate also supports saving videos from Facebook, Vimeo, MetaCafe, DailyMotion &YouKu etc. Besides, it’s also a good choice to download video directly as MP3 file if you prefer audio than video. While installing this YouTube video downloader Android app on your mobile phones, you should be careful about what kind of permissions you grant, because safety is number one priority. When you are trying to download this app, you should be careful that TubeMate isn’t on Google Play, and there are many infected fake TubeMates on Google Play and internet, so you should only download it on its verified official website. After the downloading, install the APK file on your phone. As TubeMate has a search bar, so you can input any keyword you like to find your favorite videos, you can also copy and paste the URL of YouTube videos directly instead. When selecting a video, you are given the choice to download or watch it. If you like the video, you can press the green downloading arrow to keep it on your phone. At that moment, a new interface will pop up on which you can select the video quality you want to download. TubeMate allows users to download videos maximum size up to 2K, so feel free to select any resolution suits for you. When you choose your ideal resolution, just click the Download button, and it starts to download. You should note that the downloaded videos will be stored on your SD card by default, you can change the directory location at any time as you wish. Videoder is a born minimalist, as we can see from its simple interface, and all the features are arranged briefly. It has good user experience despite there are ads there, it has to live after all. All the operations are straightforward, anyone can understand them when they use it the first time. Simple as it seems, it does a good job when you utilize it to capture videos from YouTube with different resolutions and formats. With this free, secure, lightweight and fast YouTube video downloader for Android in hand, one can save multiple video files at a time with different resolutions on smartphones like a cork. Now let’s see the usage of this app. How to Save YouTube Videos on Android Phone with Videoder? Videoder’s official App store is Uptodown, so you can only download Videoder apk file from this site. An apparent advantage of Videoder is the built-in web browser, which lets you download streaming videos directly from supported sites, such as YouTube, DailyMotion, Facebook &Twitter etc. This provides you a shortcut to access to popular video contents coming this month, and download the videos satisfying you incidentally. You can also directly copy a YouTube video from address bar and paste in the search box to download it. After you decide which video you want to download, just click on the white arrow on the top of the screen, the download interface will pop up. In this menu, you have two options, download videos or audios. Both audio and video options have different qualities for you, you can choose between MP4, FLV, and 3GP formats. When you set your quality, a new menu will prompt you to choose your download location. After you select it, just tap “START DOWNLOAD”, the downloading process starts. When it comes to saving YouTube videos on mobile devices, VidMate is an app that can’t be ignored because it gives users free access to downloading videos from YouTube of the highest quality. Besides, to make things more easier for users, the video contents in this app are classified by coming soon, new releases, top rated and popular. That’s not all, this YouTube video downloader app also gives users the ability to resume, pause, restart, break or stop during the downloading process. As this downloading process can work in the background, so you can be free to use other apps smoothly at the same time. Here we bring the step to step guide to download YouTube videos to your phone gallery or SD card on your Android phone. As YouTube is pretty strict about its stance on not allowing downloads of its videos, so any app that has the feature of downloading YouTube videos has been removed from Google Play. You can only download VidMate from its official or other verified 3rd party markets. Now download VidMate from its official site here. Launch the YouTube downloader Android app after the installation, then click on the YouTube icon on the main interface to open YouTube. Input keywords on YouTube to search for your desired video, music, TV series or documentary that you’d like to keep. Open the video, and you will see the Download button lie at the lower right corner. Click on the Download button, then you will be asked to select video saving resolution. Select your ideal resolution for the video, you are also given the choice to download the video as music in MP3 or M4A format. Click on the Download button then the app will download automatically and you will see the downloading progress bar. If you want to select SD card as your download location, just go to the Downloaded section, and the storage selection option lies below this window. When we are in the outside, we always keep a mobile phone on our pocket because the computer is too large to be taken. So, for those who are addicted to YouTube, it makes sense to download all the videos from YouTube in mobile directly so that we can watch them offline all the times. But the problem is that there is no official app available from YouTube to download videos using Android phone or tablet. 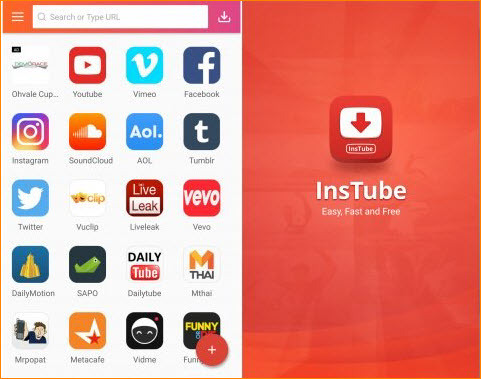 Despite that, there are a handful of Android apps that have the ability to do this, and InsTube is one of best as it’s light-weight and user-friendly. 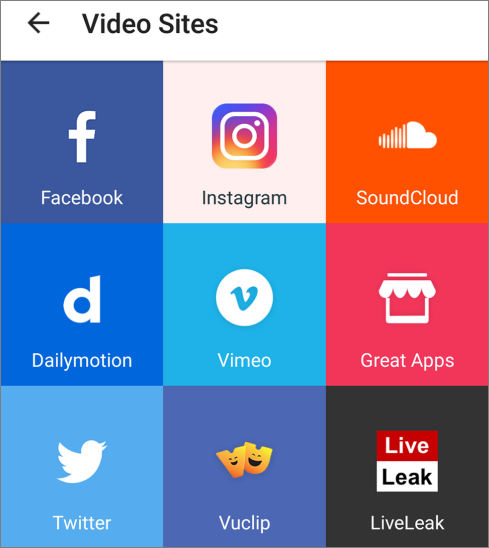 This Android YouTube video downloader app supports downloading video & music from many popular online video hosting sites including, YouTube, SoundCloud, Twitter, Vevo and many more. With this video downloader app in hand, you can easily download YouTube HD & UHD resolution videos with the highest downloading speed on your Android phone directly, even if you have a very slow Internet connection. The usage of this app is similar to other 3 apps but with minor differences, so I will omit the steps. As the world’s most popular video streaming site, YouTube is always at the forefront of the video technology field, as it can provide 4K, 8K, 360 degree, VR & 60fps videos. Besides, it’s also a great source for knowledge, entertainment, sports, music & game. With so many wonderful video content gathered in YouTube, there must be at least one video that you want to save on your Android smartphones offline to play again and again. But the thing is, YouTube doesn’t allow users to directly download videos from it, and any app on Google Play that has the feature to do the download thing has been removed as it violates the terms of YouTube. Luckily, there are many 3rd party app that can download the videos/audio from YouTube directly to your Android phone storage. And SnapTube is one of the best among them that can’t be ignored. SnapTube has a very decent look and easy to navigate features. The Android app supports to download online videos from multiple video websites including YouTube, Facebook, Twitter, IGTV & Vimeo etc.. The best thing about this tool is that it has a built-in search box which can help you to search for the videos with the keywords without even opening YouTube. To download YouTube videos on your gallery or SD card, you just need to copy and paste the video link manually, then SnapTube will do the rest for you. Streaming video can’t be more accessible nowadays, as long as you have a smartphone and a decent Internet connection, but there are still occasions that a stable Internet connection is not available. In this situation, if will be a good option to keep these online YouTube videos offline, so that you can take your videos on the go when you’re out of range of cellular connections or WiFi hotspots. There are plenty of video downloader that can save YouTube videos on Windows, Mac, iOS and Android, and here we’ll talk about YouTube video downloader for Android. If you have no idea of what’s the best app, you can give NewPipe a try, an open source Android app that can download video from YouTube to your phones, neither on the internal storage or SD card. NewPipe maybe lightweight, but it’s fully-equipped, it’s built by the developers to provide users with original YouTube app experience. The interface is quite self-explanatory, without any bells and whistles, or annoying ads. Users can feel free to watch, listen and download YouTube videos in this one-stop app. Unlike many Android apps, NewPipe will not collect any user data or usage behavior, completely safe. Note: You can’t find NewPipe in the Google Play Store, any YouTube downloader will be banned by Google, so don’t be misled by any ads or pop-ups. It is advised to download this app from its official site or trusted third-party app stores. Then you should allow your Android device to install and run apps downloaded from other places. Be cautious when you turn on this setting, as you must make sure you only download apps you know are safe and reliable. Download NewPipe and install it on your phone. Open the app, search for the videos on YouTube, until you find the one that you want to save. When you find the target one, don’t hesitate to click it. Tap on the Download button and you’ll see a list of formats and qualities, select the quality and format of the file. If you have a high-end device then by all means download the highest possible quality versions, but remember that the higher the resolution the bigger the file: if your phone or tablet doesn’t have much free space, YouTube videos will soon fill it up. Click the OK button, and the video will be downloaded automatically to your phone gallery or SD card. There are a ton of reasons that users want to save and download YouTube videos offline to Android smartphones for future use. Some users like to learn something through a video in their fragmented time, such as on the subway, or before sleep. Other users like to use content to make re-creation, or remixes etc.. No matter your reason, first, you need to download these videos offline, and a YouTube video downloader is essential. 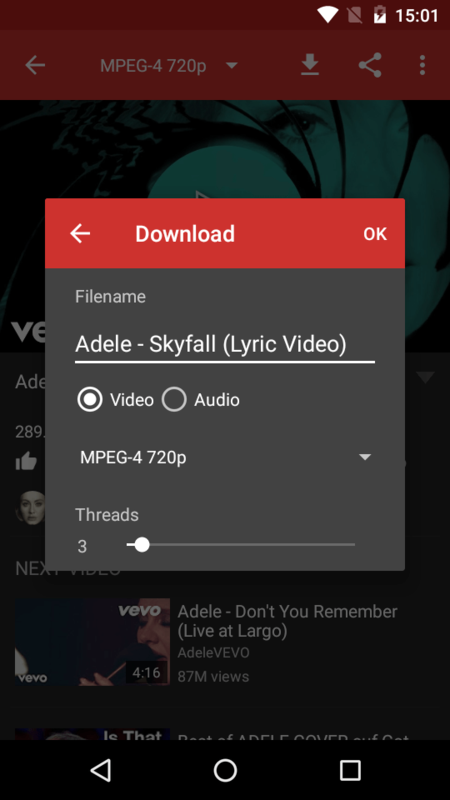 And, here we handpick a new member to our list – YouTube Downloader for Android. This app is the complete package which contains all the features that included in the above-mentioned applications. You can download your targeted video in an easy, fast, and smooth way; besides, there is also a built-in search option, and you can select the resolution and format for the video. The regular updates will keep this app bug-free and you will not encounter with any problem for sure. Apart from those one-stop features, it’s also very easy to use the this YouTube video downloader app for Android. Just copy the video link you want to download, and click the video downloading option, this app would download and save your favorite videos directly to your phone. While watching a video, you can download as well as share the video to your friends. All these features and a fine working experience present at one place make this app one of the best choices among the users. With 300 hours of videos uploaded every minute and nearly five million videos watched on YouTube per day, YouTube continues to grow faster than anyone can keep up with. It’s no surprise that users absolutely love watching their favorite content makers create interesting content and ideas. Unfortunately the internet doesn’t always travel with us, so for those who are addicted to YouTube, being able to download YouTube videos is hugely valuable. And here we bring another option – YTD Video Downloader for Android. YTD is a popular lightweight video and audio downloader app for Android, it doesn’t consume much of your device resources. With it, you can get access to unlimited downloads from a number of streaming sites. Once the app is installed on your Android device, open the interface to click on the download tab. Next, open YouTube in your browser and search for your preferred video file. Click to play it and select the URL at the top of the YouTube interface. Right-click to copy the link and paste it into the search bar of the YTD Video Downloader interface. As soon as you click download, your video will be downloaded as MP4 file or converted to MP3 audio. Not only does YTD works in Android platform, but also it has Windows and Mac versions. To download YouTube videos on MacBook, you can refer to this article: Top 12 YouTube Video Downloader for Mac that Work 2019. All these 8 best YouTube video downloader for Android enable you to download YouTube videos to your phone gallery or SD card, hope this list can help you make a good decision. Just try any of them and enjoy your favorite videos offline. And don’t forget to let me know if you have any question regarding how to use these Android apps.